Like Dua Lipa, Rita Ora has been out and about at Pre-Grammy events. The ‘Phoenix’ singer attended both the Spotify Best New Artist 2019 party and the Warner Music Pre-Grammy celebration on Thursday (February 7) in Los Angeles, California. 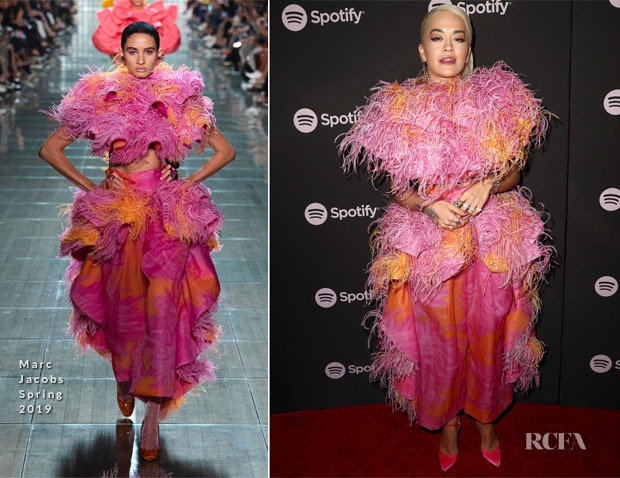 Spotify’s Best New Artist 2019 Party: She certainly isn’t scared to make a statement and this feathered Marc Jacobs Spring 2019 look definitely turned heads. Seeing more stomach would have helped balance the swirls of colours and plumes. At the moment, she’s looking rather swept away by the decoration. Comparisons will likely be drawn to Zendaya’s look. Warner Music Pre-Grammy Celebration: It was back to a more streamlined silhouette with her lilac Escada gown. With the high ponytail, it could have gone straight to prom territory but her chunky gold jewellery prevented that from happening. It’s too bad the fit doesn’t seem like it’s quite there.